Sometimes simply going to work can lead you to the love of your life! That’s exactly how this adorable duo’s love story began. Courtney was working as a personal trainer at the gym where John was a member. “My friend, and matron of honor, was the one who introduced us,” Courtney said. “We were friendly with each other, mostly in group settings, for over a year until our first date.” As for the proposal? On December 10, 2016, Courtney and John visited Peddlers Village with friends to see the Christmas lights. Little did she know, John had been planning a romantic proposal for weeks prior. “I thought John and I were just having our photo taken in front of a super cute lit-up water mill, but a few secret code words later and he was down on one knee and I was in tears.” If you think their proposal was sweet, just wait until you see Courtney and John’s wedding images captured by CWM vendor guide member, Nikki & Chip. It’s wedding day magic at The Hamilton Manor filled with the perfect amount of details and happy moments that are pulling at our heartstrings today. It’s equal parts rustic and modern brought to life through custom wedding invitations and programs by Lace and Belle, whimsy In Full Bloom bouquets, a stunning Watters bridal gown, charming lantern centerpieces, and a whole lot of love, among much more. See our favorite moments from Courtney and John’s gallery and don’t miss their highlight film below! From Nikki & Chip Photography…Hot, hot, hot! 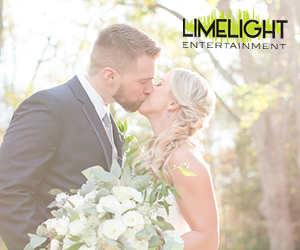 Those words easily describe Courtney and John, and they also define their wedding-day weather at The Hamilton Manor. Although it was mid-September, the sun was out in full force! But there were no worries. They totally kept their cool. Their wedding was undoubtedly them: Classy, unpretentious and fun! Their chosen color palette of ivory and blush mixed with natural greenery was striking, and the perfect complement to their beautiful stationery from Lace and Belle paired with rustic details. The ceremony went off without a hitch and SCE Event Group kept everyone on the dance floor (as always) at the reception. The love in the room was palpable when a montage of photos featuring John’s late father was displayed on the screens toward the end of the evening–-such a meaningful tribute. The couple also ended the night with one of our favorite images of the year—popping a bottle of champagne outside. It was awesome! Would you say that you had a theme? And what types of details did you incorporate? I wanted our wedding theme to be simple, yet chic. Romantic but not mushy. Our details included hints of soft blush, ivory, and natural greenery. One detail that was a must for me was for my something blue to be visible, yet out of the ordinary. My bouquet was wrapped in the most beautiful plant-dyed indigo ribbon. I think that really popped amongst my ivory dress and the other neutral details. Our centerpieces were tall candles set in even taller lanterns. Around them was a wreath of greens. Our centerpieces were gifted to our family members after the wedding was over. I figured, why not give them something that will last longer than a floral centerpiece? What made you choose your venue, The Hamilton Manor? THE BARN! From the second I saw photos of the barn online I knew that I wanted our ceremony to take place there. I loved the rustic, yet modern, atmosphere of The Hamilton Manor. Our cocktail hour was held in the cellar of the venue which embodied a bar-type feel. With our wedding being on a Sunday, and during football season, we were also able to have whatever games were on live on the TV’s around the bar. John’s friends loved that! What is your favorite wedding-day memory? Our best memory would be our ceremony. Right after the “I Do’s,” turning around and walking back down the aisle surrounded by all of our family and friends. It was truly an indescribable feeling of love and pure happiness. Our first dance song was “Today” by Brad Paisley. It was a perfect song to capture our feelings, yet not make both of us cry.